The members of the pine family (pines, spruces, firs, cedars, larches, etc.) have cones that are imbricate (that is, with scales overlapping each other like fish scales). These pine cones, especially the woody female cones, are considered the "archetypal" tree cones. The female cone has two types of scale: the bract scales, and the seed scales (or ovuliferous scales), one subtended by each bract scale, derived from a highly modified branchlet. On the upper-side base of each seed scale are two ovules that develop into seeds after fertilization by pollen grains. The bract scales develop first, and are conspicuous at the time of pollination; the seed scales develop later to enclose and protect the seeds, with the bract scales often not growing further. The scales open temporarily to receive gametophytes, then close during fertilization and maturation, and then re-open again at maturity to allow the seed to escape. Maturation takes 6–8 months from pollination in most Pinaceae genera, but 12 months in cedars and 18–24 months (rarely more) in most pines. The cones open either by the seed scales flexing back when they dry out, or (in firs, cedars and golden larch) by the cones disintegrating with the seed scales falling off. The cones are conic, cylindrical or ovoid (egg-shaped), and small to very large, from 2–60 cm long and 1–20 cm broad. After ripening, the opening of non-serotinous pine cones is associated with their moisture content—cones are open when dry and closed when wet. This assures that the small, wind disseminated seeds will be dispersed during relatively dry weather, and thus, the distance traveled from the parent tree will be enhanced. A pine cone will go through many cycles of opening and closing during its life span, even after seed dispersal is complete. This process occurs with older cones while attached to branches and even after the older cones have fallen to the forest floor. The condition of fallen pine cones is a crude indication of the forest floor's moisture content, which is an important indication of wildfire risk. Closed cones indicate damp conditions while open cones indicate the forest floor is dry. As a result of this, pine cones have often been used by people in temperate climates to predict dry and wet weather, usually hanging a harvested pine cone from some string outside to measure the humidity of the air. Members of the Araucariaceae (Araucaria, Agathis, Wollemia) have the bract and seed scales fully fused, and have only one ovule on each scale. The cones are spherical or nearly so, and large to very large, 5–30 cm diameter, and mature in 18 months; at maturity, they disintegrate to release the seeds. In Agathis, the seeds are winged and separate readily from the seed scale, but in the other two genera, the seed is wingless and fused to the scale. The cones of the Podocarpaceae are similar in function, though not in development, to those of the Taxaceae (q.v. below), being berry-like with the scales highly modified, evolved to attract birds into dispersing the seeds. In most of the genera, two to ten or more scales are fused together into a usually swollen, brightly coloured, soft, edible fleshy aril. Usually only one or two scales at the apex of the cone are fertile, each bearing a single wingless seed, but in Saxegothaea several scales may be fertile. The fleshy scale complex is 0.5–3 cm long, and the seeds 4–10 mm long. In some genera (e.g. Prumnopitys), the scales are minute and not fleshy, but the seed coat develops a fleshy layer instead, the cone having the appearance of one to three small plums on a central stem. The seeds have a hard coat evolved to resist digestion in the bird's stomach. Members of the cypress family (cypresses, arborvitae, junipers, redwoods, etc.) differ in that the bract and seed scales are fully fused, with the bract visible as no more than a small lump or spine on the scale. The botanical term galbulus (plural galbuli; from the Latin for a cypress cone) is sometimes used instead of strobilus for members of this family. The female cones have one to 20 ovules on each scale. They often have peltate scales, as opposed to the imbricate cones described above, though some have imbricate scales. The cones are usually small, 0.3–6 cm or 1⁄8–2 3⁄8 inches long, and often spherical or nearly so, like those of Nootka cypress, while others, such as western redcedar and California incense-cedar, are narrow. The scales are arranged either spirally, or in decussate whorls of two (opposite pairs) or three, rarely four. The genera with spiral scale arrangement were often treated in a separate family (Taxodiaceae) in the past. In most of the genera, the cones are woody and the seeds have two narrow wings (one along each side of the seed), but in three genera (Platycladus, Microbiota and Juniperus), the seeds are wingless, and in Juniperus, the cones are fleshy and berry-like. The cones and seeds of Sciadopitys (the only member of the family) are similar to those of some Cupressaceae, but larger, 6–11 cm long; the scales are imbricate and spirally arranged, and have 5-9 ovules on each scale. 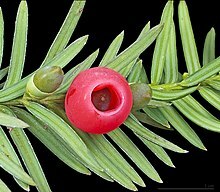 Members of the yew family and the closely related Cephalotaxaceae have the most highly modified cones of any conifer. There is only one scale in the female cone, with a single poisonous ovule. The scale develops into a soft, brightly coloured sweet, juicy, berry-like aril which partly encloses the deadly seed. The seed alone is poisonous. The whole 'berry' with the seed is eaten by birds, which digest the sugar-rich scale and pass the hard seed undamaged in their droppings, so dispersing the seed far from the parent plant. Though not included under the conifers, this group of cone-bearing plants retains some types of 'primitive' characteristics. Its leaves unfurl, much like ferns. There are three extant families of Cycads of about 305 species. It reproduces with large cones, and is related to the other conifers in that regard, but it does not have a woody trunk like most cone-bearing families. Like the Cycads, this unique cone-bearing plant is not considered a conifer, but belongs in the Order Welwitschiales. Welwitschia mirabilis is often called a living fossil and is the only species in its genus, which is the only genus in its family, which is the only family in its Order. The male cones are on male plants, and female cones on female plants. After emergence of the two cotyledons, it sets only two more leaves. Those two leaves then continue to grow longer from their base, much like fingernails. This allows it great drought tolerance, which is likely why it has survived in the desert of Namibia, while all other representatives from its order are now extinct. For most species found in Australia, male and female cones occur on the same plant (tree or shrub), with female usually on the higher branches towards the top of the plant. This distribution is thought to improve chances of cross-fertilization, as pollen is unlikely to be blown vertically upward within the crown of one plant, but can drift slowly upward in the wind, blowing from low on one plant to higher on another plant. In some conifers, male cones additionally often grow clustered in large numbers together, while female cones are more often produced singly or in only small clusters. A further characteristic arrangement of pines is that the male cones are located at the base of the branch, while the female at the tip (of the same or a different branchlet). However, in larches and cedars, both types of cones are always at the tips of short shoots, while both sexes of fir cones are always from side buds, never terminal. There's also some diversity in bearing in Cupressaceae. Some, Cupressus for instance, has little or no differentiation in the positions of male and female cones. Cone crop potential can be predicted in various ways. An early indication of a potential crop can be a period of abnormally hot, dry weather at the time of bud differentiation, particularly if the current and preceding cone crops have been poor (Nienstaedt and Zasada 1990). Estimates of cone crop potential can be made by counting female reproductive buds in fall or winter, and an experienced observer can detect the subtle morphological differences and distinguish between reproductive buds and vegetative buds (Eis 1967b). White spruce seed collection is expensive, and collection from cone caches of red squirrels is probably the cheapest method. The viability of seed from cached cones does not vary during current caching, but viability drops essentially to zero after being in caches for 1 or 2 years (Wagg 1964). Collection of cones in seed orchards has been facilitated by the counter-intuitive technique of “topping” and collection of cones from the severed crown tops at one-third the cost of collection from untopped trees and without decreasing cone production (Slayton 1969, Nienstaedt 1981). Developing Pineapple pseudocone galls on Norway Spruce. Norway and Sitka spruce are prone to the formation of Pineapple gall pseudocones caused by the woolly aphid, Adelges abietis. These are not cones, although they closely resemble them. Alder trees are not even conifers, however the mature seed bearing structures closely resemble cones. Cone in the coat of arms of Sarrant. Because of their widespread occurrence, conifer cones have been a traditional part of the arts and crafts of cultures where conifers are common. Examples of their use includes seasonal wreaths and decorations, fire starters, bird feeders, toys, etc. An intriguing derivation of the impossible bottle mechanical puzzle takes advantage of the fact that pine cones open and close based on their level of dryness. In constructing the pine cone in the bottle display, a closed, damp cone of suitable size is inserted into a narrow-mouthed bottle and allowed to open upon drying. Cone cows are traditional homemade toys, made by children using material found in nature. The most common design is a spruce or pine cone with sticks or matches for legs, which can easily be attached by forcing them between the cone scales. Playing with cone cows often includes building an animal enclosure from sticks. For the most part, cone cows have been displaced by manufactured toys, at least in affluent countries, but the creation of cone cows still enjoys some popularity as an outdoor activity for children. Cone cows are a part of children's culture in Finland where they are known as Käpylehmä (plural: Käpylehmät) and Sweden where they are known as kottkor or kottdjur (cone animals). Schools and other institutions teach children how to make cone cows as part of outdoors education on nature and history. In Finland there is a fairground with cone cow sculptures large enough for children to ride on. In Sweden, a video game was released in which the player may build virtual cone cows. Swedish artist Lasse Åberg has created artwork with cone cows, which has been included in an alphabet book and featured on a Swedish postage stamp among other classic toys. Cones are also occasionally used as a charge in heraldic coats of arms. Pine cones are symbolic for the pineal gland (which is named after the pine cone). Pine cones were also used as symbols of fertility in ancient Assyrian art. In Christian symbolism, they are closely related to the tree of life. A pine cone covered in ice after an ice storm. A classic example of a Lebanese Cedar cone. Young female cones of loblolly pine receptive for pollination. Loblolly pine male cones ready to cast pollen. Cross section of maturing shortleaf pine cone showing seeds (arrows). Loblolly pine branch with cones of different ages; 2-yr old cones will disperse seeds during fall and winter. Cluster of Norway Spruce cones on Hokkaidō. Pinus canariensis male cone in Gran Canaria. ^ Dawson, Colin; Vincent, Julian F. V.; Rocca, Anne-Marie. 1997. How pine cones open. Nature 390: 668. ^ "Ask a Scientist: Pine Cone Wet and Dry". Newton.dep.anl.gov. Retrieved 2013-08-30. ^ Eis, S. 1967b. Cone crops of white and black spruce are predictable. For. Chron. 43(3):247–252. ^ Wagg, J.W.B. 1964. Viability of white spruce seed from squirrel-cut cones. For. Chron. 40(1):98–110. ^ Slayton, S.H. 1969. A new technique for cone collection. USDA, For. Serv., Tree Plant. Notes 20(3):13. (Cited in Nienstaedt and Zasada 1990). ^ Nienstaedt, H. 1981. Top pruning white spruce seed orchard grafts does not reduce cone production. USDA, For. Serv., Tree Plant. Notes 32(2):9–13. (Cited in Coates et al. 1994). ^ "Pine Cone Craft Projects". Familycrafts.about.com. 2013-08-23. Retrieved 2013-08-30. ^ zupperzipper (2008-07-13). "Pine Cone in the Bottle Display". Instructables. Retrieved 2013-08-30. ^ Kapsyljakt med Anki och Pytte review "You build cone cows"
^ Åbergs ABC[permanent dead link] "a little book about cone cows, small fears, swarming helicopters and such"
^ Posten.se press release Archived 2010-09-13 at the Wayback Machine "Motives include [..] life in the countryside, which shows both the cone cow, a doll in a traditional outfit, and a horse and carriage toy"